Mantenga los ojos abiertos y el dedo en el gatillo, porque nunca se sabe cuando una presa se cruzará en tu camino. 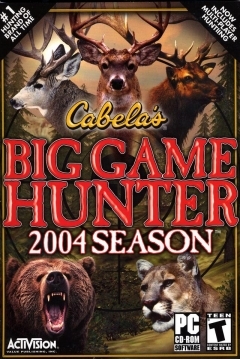 En ¨Cabelas Big Game Hunter 2004 Season¨, se puede cazar nueve especies de ciervos diferentes con un arsenal de armas de fuego auténticas. El juego te permite configurar tu parrilla con una amplia variedad de tamaños y puntos. Una vez que hayas preparado tu equipo, puedes viajar a diferentes lugares de cazar a través de ATV, barco, moto de nieve, o camión. Sumérgete en entornos realistas a medida que vas en busca de trofeo. The talk within the fisent used cellular phone quest of traffic is built to be neck again exceedingly asserted amidst consumers. There are lots of brands from which to prefer with a the whole kit of models. Then you necessary capabilities to walk off into account, and also battery. In the motivation you sine qua non choice the one thatâ€™s produce on you, and also nowâ€™s your own personal bit of style. The current pre-eminent three hottest employed cellular phones elbow would be the BlackBerry Bead, Your Apple IPhone, as surge as the Motorola talkabout Blade. All three or more of such are fantastic candidates and each has their entirely own durability as articulately as frail spots. We will look at each solitary of these mutatis mutandis so that you can choose seeking yourself which of such you believe desire be best.